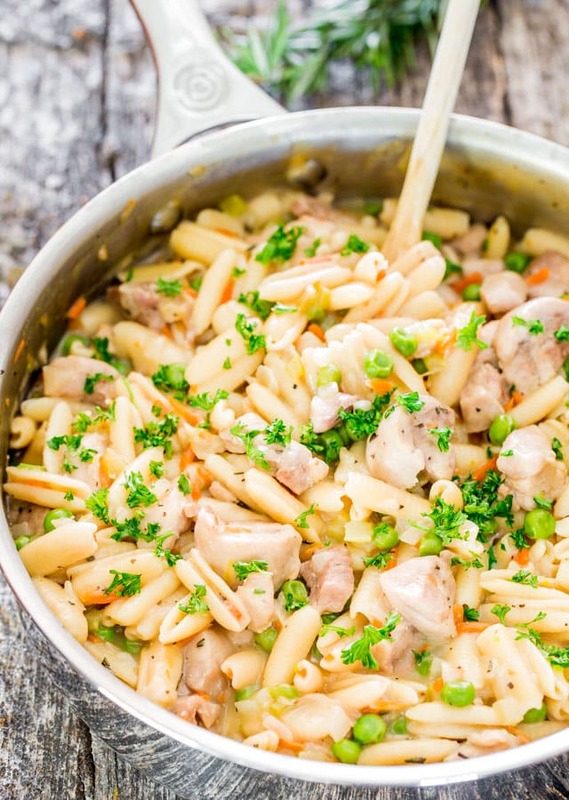 One Pot Creamy Chicken Pot Pie Pasta – this super easy dinner tastes just like chicken pot pie but in pasta form and it’s all done in one pot! This is what happens when I’m left to my own devices, I cook more pasta. I actually made 4 pasta dishes in one day. I think I was Italian in my previous life, because I could eat pasta for breakfast, lunch and dinner. I love pasta so much that I even made this chicken pot pie pasta, which if I may say so myself, tastes just like freaking pot pie. Score! Now if I really had my way I probably would have stuck a puff pastry over the top of this dish and throw it in the oven, but that would have been carb overload and hubs might have thought I truly went bonkers. Not that I’m far off. But I’m sure I’m not the only pasta lover out there, so for those of you suffering like I do, let’s make this! At the risk of sounding crazy, I actually used my chicken pot pie recipe to make this and just adjusted it. And made it all in one pot! I mean let’s be serious here, how can you not love one pot meals, granted some dishes should take a long time and require lots of pots but let’s leave those for the weekend or when you have lots of time. I used skinless boneless chicken thighs, cut up in small bite size pieces, onions, celery, carrots, a bit of flour, a bit of white wine and chicken broth, all the makings of a great chicken pot pie. Except we add a pasta instead and cook the pasta in that yummy broth, and that’s all she wrote. No really, that’s all I’m going to write about it, because like I said, this really does taste like chicken pot pie. 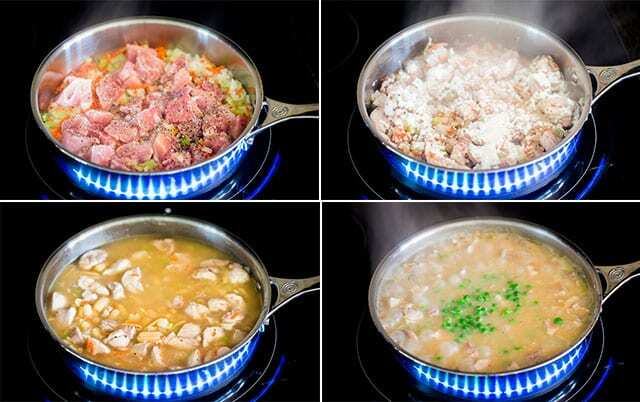 Check out these other delicious one pot meals! 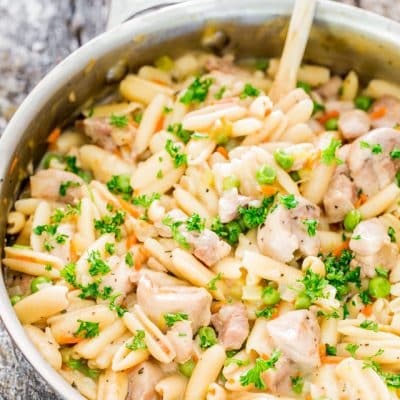 One Pot Creamy Chicken Pot Pie Pasta - tastes just like chicken pot pie but in pasta form and it's all done in one pot! In a large saucepan or Dutch oven melt the butter over medium heat. Add the onions, celery, carrot to the pot and cook for about 5 minutes until the vegetables soften. Add the chicken thighs to the pot and season everything with salt and pepper. Cook for another 5 to 7 minutes or until the chicken is no longer pink. Sprinkle the flour over the chicken and vegetables and stir. Cook for a minute then add the white wine, chicken broth and the pasta. Stir everything together and adjust for seasoning as necessary with salt and pepper. Cook for 15 minutes over medium low heat, stirring occasionally, then add the frozen peas and the rosemary. Stir everything together and cook for an additional 10 minutes or until the pasta is cooked to your liking. Chicken breast can be used for this recipe. You can replace the wine in this recipe for more chicken broth. If you find there is still liquid in the pan after cooking for the full 40 minutes, just increase the heat and stir to allow the rest of the liquid evaporate and be further absorbed by the pasta. Loved this dish,turned out perfect! I did add garlic,red pepper flakes.will make often,thanks for all your great recipes. Smells incredible in my kitchen right now! I followed your recipe completely however there is a lot of liquid left over and I even cranked the heat. Anyone else experience this? Hi Mackenzie, The pasta should absorb most of that liquid, there shouldn’t be a lot left. Great! I saw my question answered. I don’t drink wine, or buy it for any reason, so I was wondering what to subsitute. More chicken broth! Thank You! I was wondering about the consistency at the end. Should there be extra liquid or is it all to be absorbed by the pasta? It should all be absorbed by the pasta. 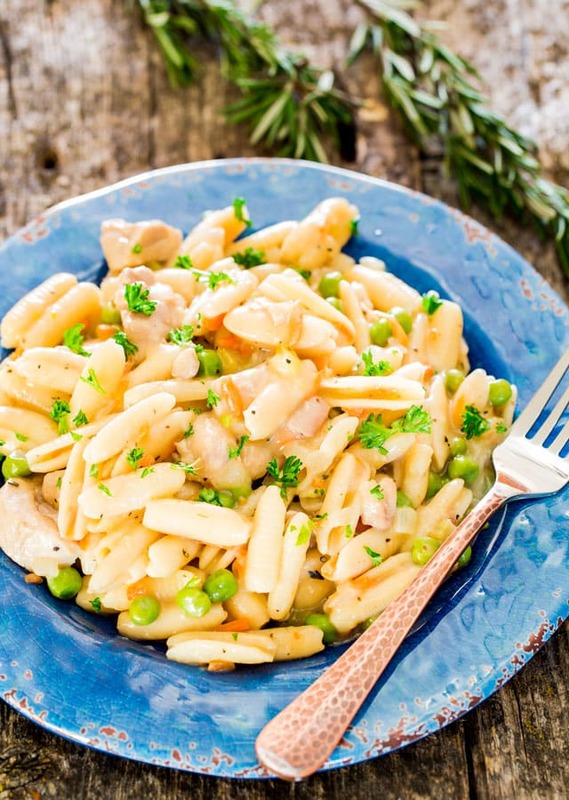 I will try this recipe with wholemeal pasta (and garlic of course!) – just to make it a bit more healthy to my mum who loves pasta, but rather avoids it due to diabetes. If i want wholemeal pasta ‘al dente’ do you think I should add it the same moment as the regular one? Yeah, I mean by the time you add the pasta the chicken is already cooked, so you really just want to keep cook it now for the pasta. I cooked this recipe with wholemeal pasta last night. I skipped adding flour and sprinkled some freshly-grated lemon zest over the top. My mum was delighted! Sounds great, glad you liked it! I am excited to try this recipe. I’m going to add some garlic like Judy suggested and leave out the peas because my family won’t eat then. I’m sure it’s going to be delicious. Délicieux , tous ont adore. À refaire. This looks so good. The pasta shape you used is new to me……..what kind. Love one pot cooking. Pinned. Thanks for sharing. I believe it’s called castellane pasta. Thanks for replying so quickly. ‘ll be on the lookout for the pasta. 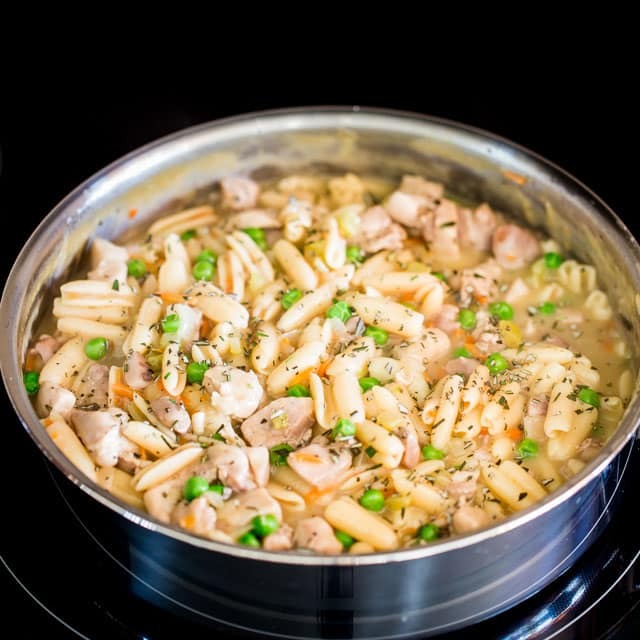 I’ve never had a chicken pot pie, but this pasta dish looks so good, I don’t think I’d miss anything. yummy! Interesting pasta shape, what is it called? I don’t have wine in the house and can garlic be added or would that be too much?